Seeing is Believing This sample manual to teach Train the Trainer is in MS Word format. Organizations that have experienced growth and change have realized the importance of continuous training and education for their employees. Achieving organizational goals is dependent on developing confident and capable trainers and instructors within the workplace. They must be knowledgeable of a variety of instructional methods in order to meet the needs of every student, which can be a challenging task. 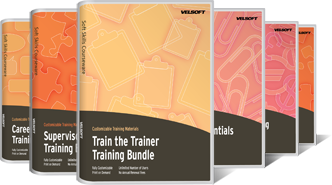 Our Train the Trainer Bundle includes six essential course titles designed specifically for instructor development. Organizations that make a pro-active decision to train their employees have realized the positive impact of workplace education. Ensuring that instructors are effectively training others is fundamental to a successful training plan. Train the Trainer customizable training materials are specifically written for this reason. Our courses in the Train the Trainer Bundle have been written to motivate organizational instructors to become passionate about their leadership role. As an instructor, you realize the importance of providing a positive training experience for your students. After your students have completed their Train the Trainer courses, they too will believe in the possibilities created through workplace education. Our training materials are fully customizable. For you, this means creating a customized, learning experience for your students. This allows you to anticipate the unique interests of learners, and adjust your training plan accordingly. We believe that effective training is adapted in order to be responsive to the experiences of the individuals taking the course. The knowledge that you share with your students can, and should be, strategically significant to your overall organizational strategy. This is why we have made our Train the Train Bundle fully customizable, along with all of our other training materials. Educating your peers; other workplace instructors; of the ways they can provide their students with quality training is a proactive step in reaching your business goals.